ZOMBIEZOO is like the ordinary zoos you have visited, only different. It has exotic animals, gift shops, restaurants, moats, fences and a zookeeper, but in this zoo, the animals are in charge. They don’t depend on people. I don’t think there are even any people around, which is why they need a pal like you. Each Zombie has their own personally with their dreams and aspirations. Check out ZOMBIEZOO and find out what it is all about! 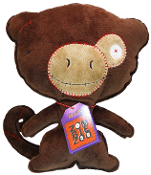 ZOMBIEZOO debuts with five unique, designer plush characters: Boo, Muck, Rob, Stich and Toxic. Each character is 12” high, constructed of soft fleece, sporting an original, turned-inside-out look, “Frankenstein” quality embroidery stitching, and endearing faces on their large heads. Adorning their necks is a personality tag on a chain. It’s the perfect gift for that special someone looking for a collectable plush friend to bond with and hug.